Every year the Royal Irish Academy awards a prize for the most outstanding Irish PhD thesis in the general area of the chemical sciences. In 2016 the Academy selected Dr Fergus Poynton and his name was put forward for the prestigious International Union of Pure and Applied Chemistry-Solvay International Award for Young Chemists. The Academy is delighted to announce that Dr Poynton has been selected as one of five winners of the International Award for Young Chemists. The award will be presented to Fergus at the World Chemistry Congress in Sao Paulo, Brazil in July. Dr Poynton's thesis was entitled "Spectroscopic investigations into the excited state processes and reactivity of Ruthenium(II) polypyridyl complexes". His novel research explored the (photophysical) properties of a Ru metal ion based complex which can act as an ultrafast light switch in the presence of DNA. It is also possible to determine the nature of the interaction of such complex molecules with DNA to improve our understanding as to how light-activated drug molecules may operate within living cells for phototherapeutic applications. The award winning essay described the thesis work and placed it in perspective to current research in the chemical sciences. A number of publications have also arisen from this research including a feature on the December 2015 issue of Nature Chemistry. In 2008 the Irish prize winner, Dr Emilie Banide, also won one of the five international awards. In the history of the awards there have only ever been two winners from Ireland. 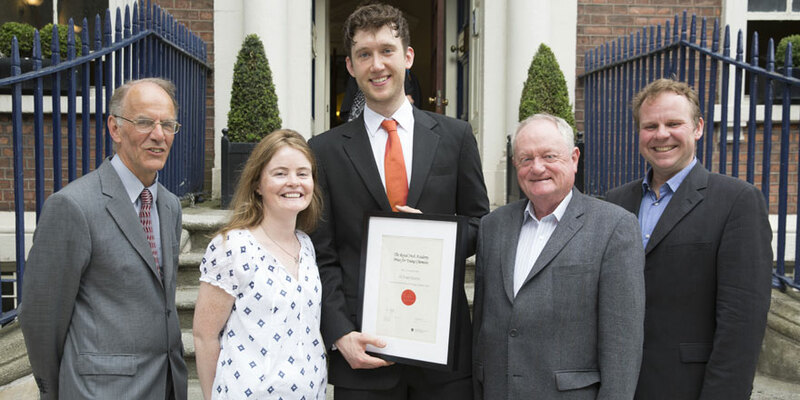 The Irish Young Chemist Prize was presented to Dr Poynton on 21 June in Academy House. Dr Poynton will now travel to Brazil in July to receive his $1,000 prize. Dr. Xinxin Xiao, a PhD graduate of University Limerick, has been selected as this year’s winner of the Royal Irish Academy’s Kathleen Lonsdale Chemistry Prize, sponsored by Henkel. Closing 12 noon Wed 9 January. Last call for submissions from Irish Ph.D. thesis students in the general area of Chemical Science. This year we were honoured to have Fields Medallist Martin Hairer with us to celebrate Hamilton Day, commemorating famed mathematician William Rowan Hamilton's 'Eureka moment'.